How to watch Carmina y amén (2014) on Netflix Australia! Sorry, Carmina y amén is not available on Australian Netflix, but you can unlock it right now in Australia and start watching! With a few simple steps you can change your Netflix region to a country like Spain and start watching Spanish Netflix, which includes Carmina y amén. We'll keep checking Netflix Australia for Carmina y amén, and this page will be updated with any changes. Carmina y amén is not available in Australia BUT it can be unlocked and viewed! 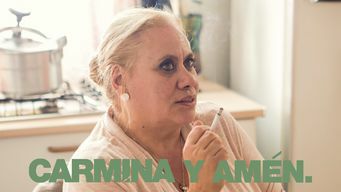 Working-class Carmina and her daughter María commit to keeping up appearances when patriarch Antonio dies before the arrival of his bonus check. A desperate mother. A grieving daughter. And a dead body they've got to keep hidden until Monday. There is a way to watch Carmina y amén in Australia, even though it isn't currently available on Netflix locally. What you need is a system that lets you change your Netflix country. With a few simple steps you can be watching Carmina y amén and thousands of other titles!